It won't cost your members a dime. With so many people struggling to make ends meet, the last thing your members need is to feel pressured by photo-directory companies to buy expensive portrait packages for their family. In today's tough economy, Instant Church Directory Online is an inexpensive alternative to traditional photo-directories. Your member information is safe and secure. We store and protect all of your information on our secure servers, so you don't have to. (Never worry about running out of memory on your personal computer.) You can also create a custom password to protect your directory. 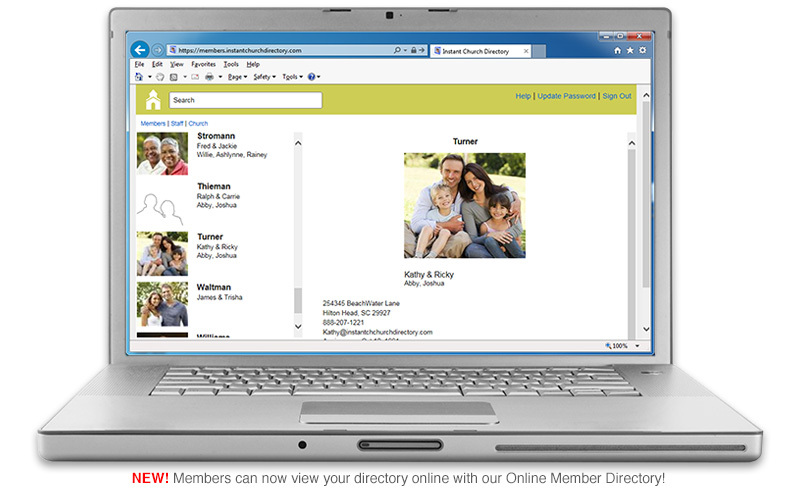 Gain 24/7 access to your Photo-Directory. Keep your member information up to date with convenient log in from any computer – at home or right in your church office. 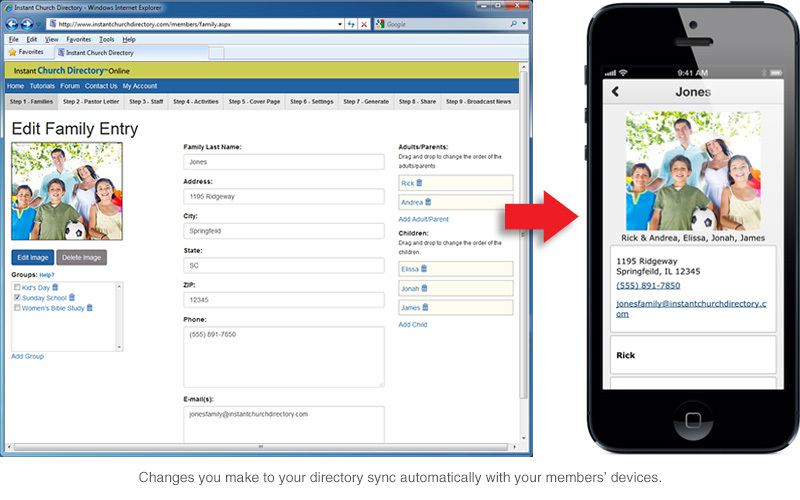 Now you and your members can sync your church's directory right to an iPhone, iPad, iPad Mini, Android device or Kindle Fire! Search, email, call or text members right from your device. And our system is fully-secure for your church and members. NEVER DEAL WITH a Photo-Directory Company AGAIN! 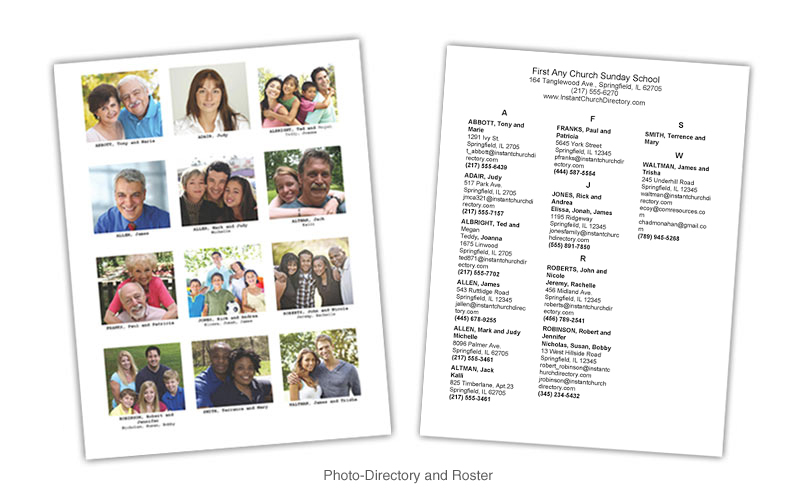 Now you can enjoy all the benefits of a commercial church photo-directory with Instant Church Directory, a no-hassle way to produce your own photo-directory in black and white or full color – on the equipment you already have. Keep track of members' birthdays with ease. Two custom fields are also provided to allow you to add any specialized information to each family entry. One field prints on the roster pages. 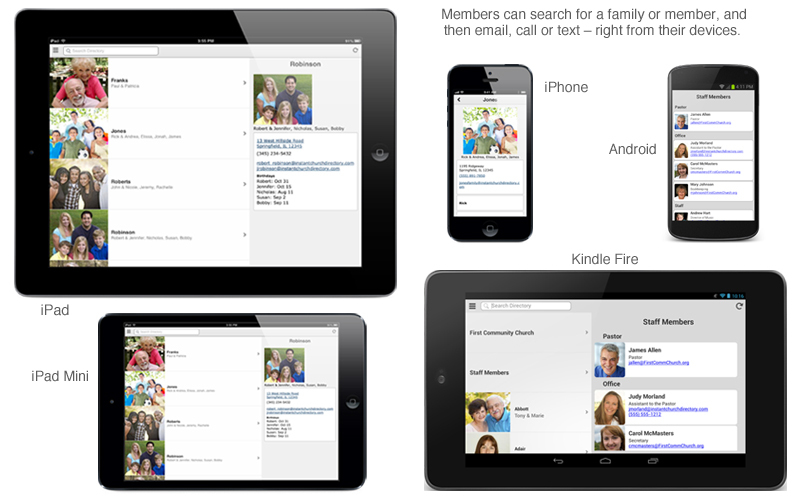 Add individuals or families to a group, and then print a directory just for that group! You can create as many groups and sub-directories as you want. Choose the high-resolution image quality option to produce a directory with crisper and sharper images when you are ready to print. Easily share your Church Directory. A unique hyperlink is provided in which you can share your directory on your church website. 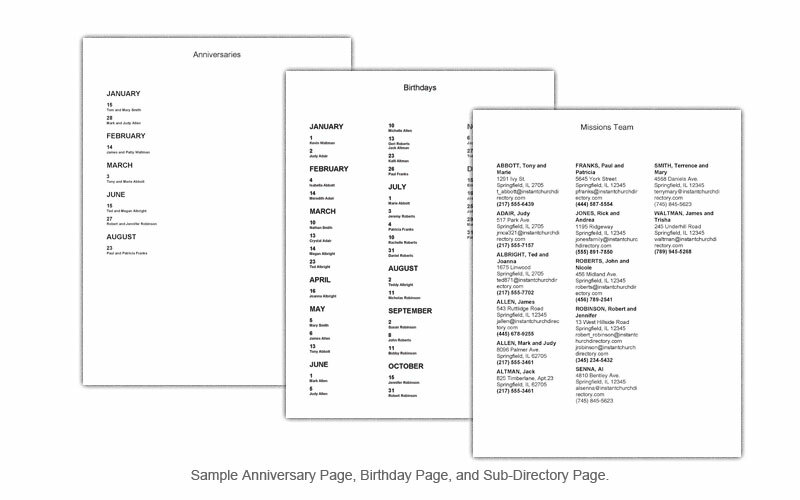 Insert your own custom pages. Invite members to take a photo of themselves and upload it to the site! When your administrator approves the photo, it appears in the directory. 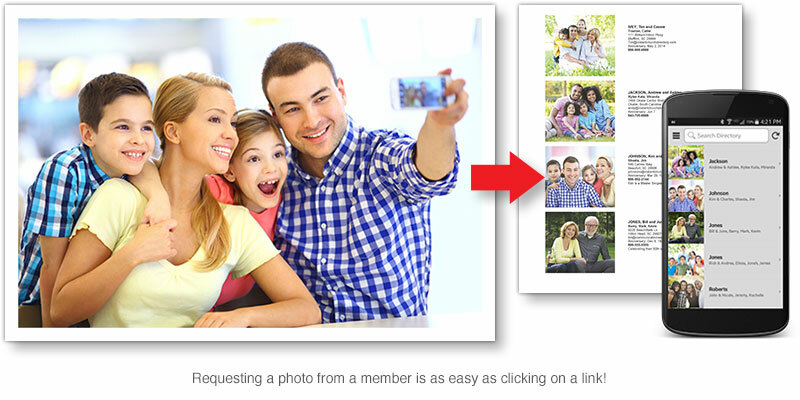 Capturing your members photos has never been as easy! 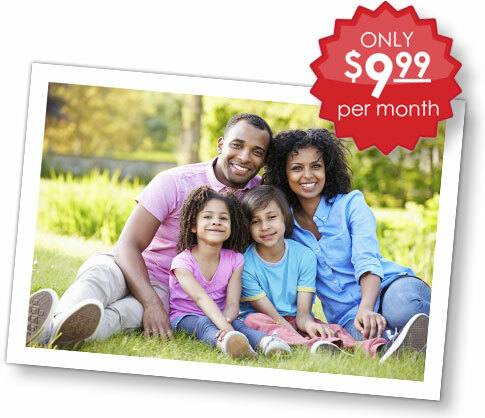 Plus, it allows members to use photos they already have and love. Free with your subscription, our Online Member Directory and Mobile Apps let you and your members view your directory right on your laptop, iPhone, iPad, iPad Mini, Android device or Kindle Fire. Online and on-the-go access to your directory. Only your members can view your church's directory. You're worried about security and privacy, and so are we. That's why we built a fully-secure system. Members have to register each device, and directories can't be shared. Only members you authorize can gain access, and directories are automatically "wiped" from all their devices if you revoke access. If you would prefer that your directory is not available via the app or online directory, simply disable the feature. FREE to you and your members. Mobile apps are free to download from iTunes, Google Play and the Amazon Appstore and there is no additional fee to turn these features on and off. All that's required is that your church has an active membership with Instant Church Directory Online. 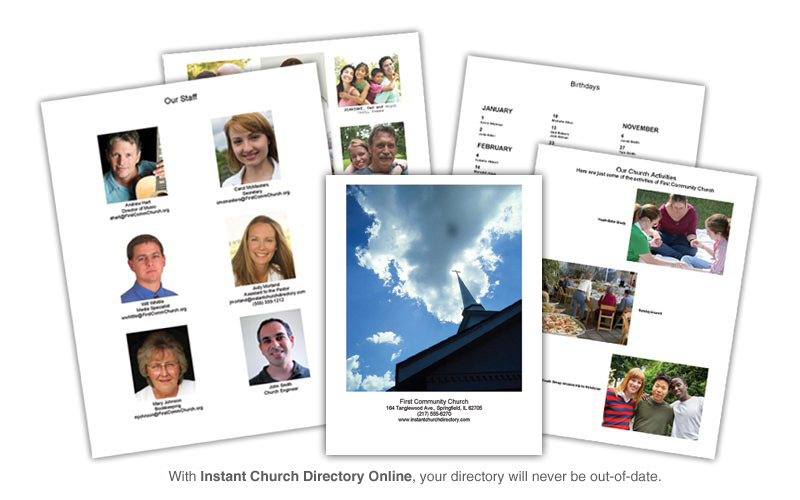 Instant Church Directory is a wonderful program and so easy to use. Everyone is so impressed -I am ashamed to tell them how easy it has been!" You have a great, easy to use program! We already have much better quality than our last commercial photo directory and our amateur photographers are having a ball with it." Try us absolutely FREE for 30 Days! If you like Instant Church Directory, do nothing and your membership will continue. All your information will automatically be saved so you won't have to start over. For just $9.99 a month, you’ll receive access to all of our features. There’s no complicated tier pricing based on the number of members and no annual contracts required. Furthermore, your members won't have to pay for the mobile app or online access, or even feel pressured to buy photos. Gone are the days of paying for and printing a directory that is immediately outdated.